Citric Acid, Natural And Artificial Flavors, Maltodextrin, Malic Acid, Sucralose, Calcium Silicate, Silicon Dioxide, Acesulfame-Potassium, FD&C Red No. 40. Read the entire label before use and follow directions provided. Assess your tolerance by mixing 1 serving (1 scoop) with 6 oz. of cold water and drink about 30 minutes before your workout. Then increase the dosage to 2 servings mixed with 12 oz. of cold water before your workout. Do not exceed 2 servings (2 scoops) in a 24-hour period. Drink 8 to 10 glasses of water daily for general good health. Not intended for use by persons under 18. Do not use if pregnant or nursing. Consult a medical doctor before use if you have a medical condition or before starting a diet or exercise program. 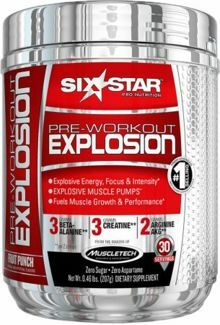 One serving (1 scoop) of this product contains up to as much caffeine as 1.5 cups of coffee. Caffeine sensitive individuals may experience the following symptoms, including (but not limited to) restlessness, nervousness, tremors, headache, anxiety, palpitations, increased heart rate, or difficulty sleeping. Do not combine with other sources of caffeine. Do not use if you have had a myocardial infarction (heart attack). Use only as directed. KEEP OUT OF REACH OF CHILDREN. 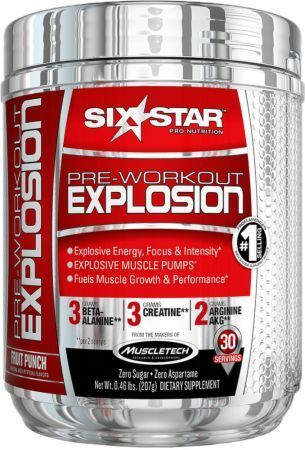 1 In just one study on 31 weight-trained test subjects randomly assigned to one of three groups, subjects consuming this same form of creatine in Six Star Explosion significantly increased their strength capacity on the bench press by 18.6% compared to baseline (6,658 vs. 5,613 joules) in just 10 days! Directions: Read the entire label before use and follow directions provided. Assess your tolerance by mixing 1 serving (1 scoop) with 6 oz. of cold water and drink about 30 minutes before your workout. Then, increase the dosage to 2 servings mixed with 12 oz. of cold water before your workout. Do not exceed 2 servings (2 scoops) in a 24-hour period. Drink 8 to 10 glasses of water daily for general good health.